Calvi is another name for Cales, the ancient city taken by the Romans in the 4th century BC in their very early stages of empire building; that is, they were just sort of moving the city limits out a bit. 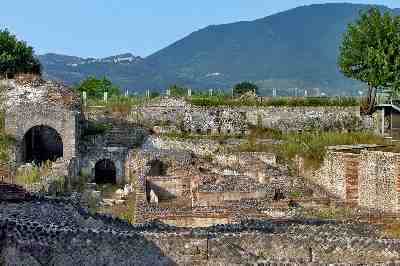 The Roman remains of Cales may still be seen today near Sparanise, 40 k/25 miles north of Naples (photo, right, by P. Mesolella). The modern town on the ancient site is named Calvi risorta (Calvi reborn!). Before the Romans, Cales had been the center of an earlier Italic population called the Ausones (or Ausoni in modern Italian), a people that inhabited areas of southern Italy well beyond Campania by about 1000 BC. That people may have come from Greece, but there is also archaeological evidence of Etruscan origin or at least influence. The source of the name Cales may(!) be the proper name Calai, mythologically said to be one of Jason’s companions aboard the Argo and to have founded Cales, this first Ausonian center of population in Campania. (There are also other places in southern Italy that claim connection to the Argonauts. For more, see entries on The Heraion near Paestum, Sirens, and Hilltowns of Cilento.) (There are other etymological possibilities for Cales. They range from the mundane and plausible Greek, kale=beautiful, to the very far-fetched, after the city of Callah, mentioned in Genesis 10:11! Pick one. Or make up your own.) As far as the letter V goes in the modern name, there are some Latin spellings of Cales as Calus—but, of course, the Romans used V, not U; thus, you wind up in the Middle Ages with some fancy orthographic hocus-pocus giving us Calvi. In any event, by the time the Bourbons got around to building one of their royal residences and hunting grounds here, the area around the old ruined city had been called the Domain of Calvi for a very, very long time. As recently as World War II the Bourbon buildings in the Demanio di Calvi were in relatively solid condition; these included the main residence and the chapel. Then the retreating Germans shelled it in 1943 and the rest is all downhill. It was a barracks, a stable and then even an elementary school until about 30 years ago. Part of the premises were then demolished to make room for a road, and other parts became a rubbish dump.The whole thing was generally subjected to all the ignominies of chaotic post-war overbuilding in the Campanian plain behind Naples. By 2002 the site had apparently been taken over by a squatter farmer who made his own "deprovements." (Is that a word? I hope so.) The former Bourbon premises were in worse condition than the remains of ancient Cales. 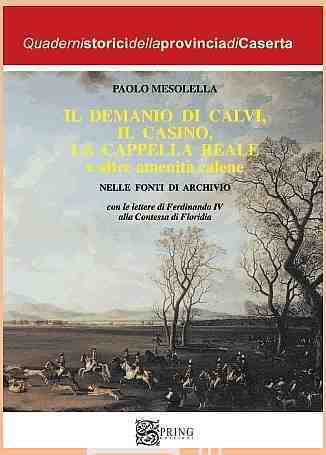 Some funds, however, were allocated in 2008 for the restoration of whatever remained: laws were drafted, speeches given, banners draped, committees formed, and a book was written about the site (il Demanio di Calvi, il Casino, la Cappella e altre amenità calene by P. Mesolella, Spring publishers, Caserta, 2008. Book cover, right. The word calene in the title is the adjective for Cales in modern Italian.) There seemed to be some enthusiasm for restoring what was once an impressive part of the Bourbon architectural/cultural heritage of the kingdom of Naples. An inventory from 1910 of this historic relic speaks of a piece of property some four square km in area; it included a Western Tower, a 12-room Casino Reale, a chapel and other out buildings. There were woods, stables, parks and room for the hunt. It was, indeed, one of Ferdinand IV’s favorite haunts and the place where he spent some years of his life writing letters to Luisa Migliaccio Partanna, the woman would then become his “morganatic” * wife after the death of his first wife, queen Caroline. This miniature royal palace was built in 1779. The architects were Francesco Collecini (1723-1804) and Giovanni Patturelli (1770-1849). The former was one of Vanvitelli’s students and then his assistant in the construction of the vast Caserta Palace (see table) and also the architect who built the Carditello residence (table). The residence at Sparanise was built before Carditello and is described as comparable to it in every way; that is, a typical bit of Bourbon splendor in the classical style of Vanvitelli. A lot of things can happen to buildings and land from 1789. In this case, the list is endless, but the site survived flooding and even the turmoil of Italian unification and, as noted, the property was intact in 1910 and even later during at least part of WWII. (Unfortunately, the Demanio di Calvi lay along the main invasion route of the Allied armies in late 1943 as they pursued the retreating Germans up towards Mt. Cassino and Rome.) But the main problem is simply the disastrous overbuilding in the Campanian plain since the 1950s. Old pieces of property were simply taken over illegally, old buildings were torn down and if they were not torn down, they were stripped bare of anything that could be salvaged. I am not aware that the enthusiasm from 2008 to restore whatever can be saved in the Demanio di Calvi has generated any tangible results. Many thanks to Serene Salvi for steering me to Calvi antica e moderna ossia memorie istoriche dell'antichissima città di Calvi by Mattia Zona, 2nd edition, pub. Raffaele Miranda, Naples. 1820.